The year is 1996. Mankind has reached a technological level where they can build bases on Mars. However, the arms race between the two superpowers, the United States and the Soviet Union, has extended to the moon and Mars. At the base, 16 boys and girls, led by Elizabeth, the instructor, have just arrived as the first members of the 'Cosmic Culture Club,' organized by the United Nations Space Headquarters, and are being welcomed by the staff. Suddenly, four unidentified combat weapons (huge rockets) appeared near the base, exchanging fires. They are the S.P.T. 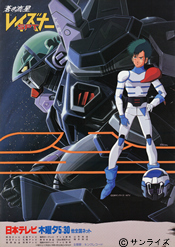 Layzner piloted by Eiji and other S.P.T.s of the chasing unit headed by Gale and others. Involved in the fierce battle, the base gets destroyed in a matter of minutes by flying beams. Only six members of the 'Culture Club'--Elizabeth, Arthur, Roanne, David, Simone and Anna--survive.